I’ve always envied those girls who talk about not washing their hair for days. I know dirty hair seems like a strange thing to envy, but when you have forty-five thousand pounds of hair (my mom’s estimation for the amount of hair on my head), skipping a day or two of washing sounds like pure heaven. When I was a tween, my dermatologist told me I could be rich if I found a way to bottle the oil from my skin and sell it. Yeah. That much oil. That said, skipping a day of washing was always out. of. the question. Let me clarify, it’s not so much the actual washing forty-five thousand pounds of hair that’s annoying, it’s all of the time it takes to dry and style forty-five thousand pounds of hair that I hate. A couple years ago my schedule was such that I worked until 2am or later, then had to be in class at 8am. And when faced with washing/blowing dry/styling hair or sleeping for an extra 20-30 minutes in that little window of sleep opportunity? Well, it’s obvious that sleeping wins. So I took to my bottle of baby powder and sprinkled a bit on my roots and rubbed it into the hair near my temples (always the greasiest area for me) and went on with my day. It felt great at first, but by the end of the day I was always super embarrassed about my greasy looking hair. Of course nobody even noticed that my hair looked different than normal, and perhaps it didn’t, but I felt like it was greasy looking and once you get that into your head, it’s just impossible to get out. If Megan Fox can’t pull off the greaser look, can’t nobody pull off the greaser look. So I turned to my salon-owning, professional product-toting mother and she handed me a little bottle of powdery dry shampoo. I wasn’t a fan. It was actually making my hair feel dirtier. Like, gritty and grimy. Turns out, this product was more for the peeps that wanted to retain a specific ‘do, rather than those like me who really just wanted to sleep in every once in a while. So it was back to the baby powder whenever I felt the need to sleep in, and I was always a little self-conscious every time I used it. My Violet VoxBox arrived, courtesy of Influenster, some time in November. Or maybe December? I honestly have no idea when it arrived. I was so busy with work/holidays/life that I opened it, took out the one item I couldn’t wait to try out, and then the box sat on the counter for like, ummm, a couple of months maybe?? But all the while, I had been using that one, awesome item. 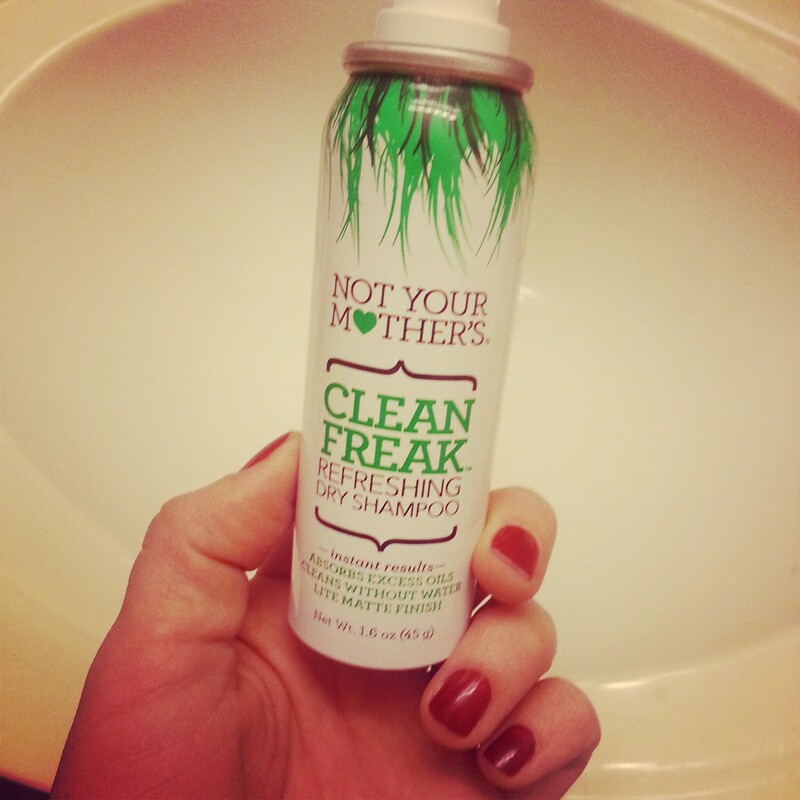 Not Your Mother’s Dry Shampoo. And it’s true, it was not my mother’s dry shampoo. But it was, and still is, awesome nonetheless. You could say that my discovery of this product is when I figured out what all of you already knew. The key to dry shampoo is spray dry shampoo. This stuff is amazing. If it weren’t for sweaty workouts, I’d probably forego every day hair washing altogether. But now I plan out my wash days (seriously) ahead of time, and on the no-wash days, I get to sleep for at least an extra 30 minutes. At least. Seems like a pretty good polish, but it is so totally not my color that I couldn’t bear to swipe it on all of my nails. I did polish one thumb though and it dried quickly and shiny, just like advertised. Gosh you guys I just can’t even sugar coat it, this bar was horrid. So horrid, in fact, that I took one bite and threw it in the garbage. I’m not one to waste food, but I just couldn’t even take one more bite. Not to mention it was about half the size of the wrapper. Lame. This was okay. It smelled great. Felt pretty good. But was awkwardly shaped and sized, making it slightly uncomfortable to wear. Decent headband for keeping your hair off of your face, but not a great headband for keeping hair out of your face while working out. 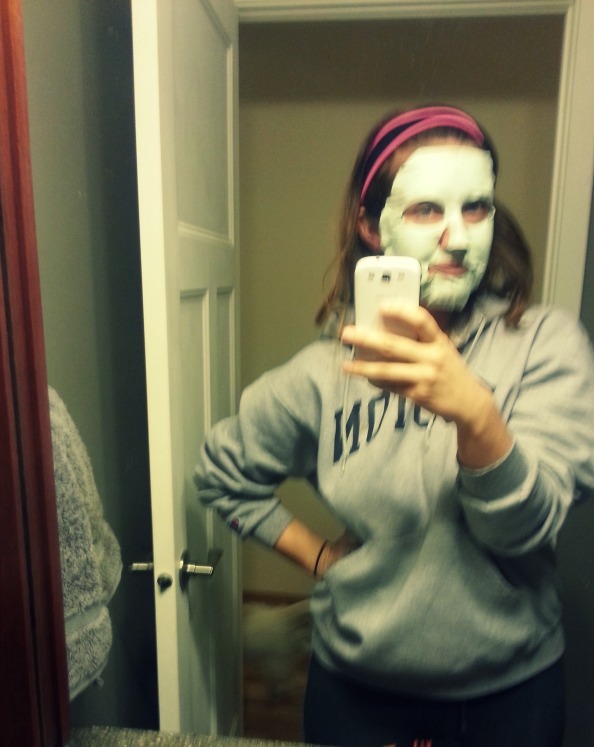 Below you will see the awkwardness of myself and the clay spa mask, as well as the headband in all of it’s “yeah I’ll stay put until you move around even the slightest bit” glory. Apparently other Influensters received a Goody Quikstyle Paddle Brush. Sadly, I did not. The moral of this incredibly long story is this; if you’re in the market for a dry shampoo that actually works, run to your nearest *insert wherever you buy this sort of thing here* and get yourself a bottle of Not Your Mother’s Clean Freak Dry Shampoo! Honestly though, where do I buy this sort of thing? I’m really not joking when I say I’ve never purchased a hair product. I’m also not joking when I say that my mom is probably cringing at the thought of me using a product not sold in a professional salon. It’ll be okay mom, really. What about you? Do you wash your hair every day? Are you lucky enough to go even more than a day or two without washing? I have a couple of friends who I was shocked to find out only wash once a week. Once a week! And to think that I never noticed their unclean hair… Perhaps I was just distracted by their bagless under eyes from all of the sleep they must be getting. I agree with you! Nobody can pull off the wet/dirty look. I really wish high fashion would move past this one.